The term "smart connected devices" refers to desktop and portable PCs, smartphones and tablets. And as you might expect, the battle for control of this market is a two-company war between Samsung and Apple. The Korean tech titan was on top for 2012 thanks to an 119.3% year-over-year increase in sales of these devices. That resulted in Samsung shipping 250 million smart connected devices last year which topped the 218.7 million units shipped by Apple in 2012. For the Cupertino based giant, that was a 44.3% year-over-year gain. 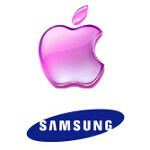 In terms of market share, Samsung had 20.8% of the market compared with the 18.2% controlled by Apple. Considering that the definition of smart connected devices includes computers, it might not be terribly surprising that Chinese manufacturer Lenovo was third. But there was a big fall-off between the number of devices shipped by second place Apple and third place Lenovo. The latter shipped 78.3 million units last year, a gain of 61.4% on an annual basis. But not all companies enjoyed annual growth. HP and Dell were fourth and fifth respectively in smart connected device shipments, and had year-over-year declines of 8.5% and 12.9% respectively. HP shipped 58.2 million smart connected devices in 2012 and Dell shipped 38.8 million units. Overall, 1.2 billion smart connected devices were shipped in 2012, a gain of 29.1% from 2011. As for Samsung and Apple, the former was led by strong smartphone sales (Samsung Galaxy S III, Samsung GALAXY Note II) while Apple was led by sales of its tablets like the Apple iPad mini and the third and fourth-generation Apple iPad models. The numbers are slightly misleading. Actually Apple sold more per volume. The reason is that Samsung releases a new device like every week and because Samsung devices are readily available at many locations. Apple is more niche and focused. Majority of their devices are sold in their stores. Numbers don't always paint the full picture. Will you justify to your statement " numbers are slightly misleading" when more iPhones and we're sold than sgs3 in q4. More per volume? Are you serious? You sound like Apple's PR guy trying to put a positive spin on coming in second. How about just be satisfied that they sold a ton of devices & made a lot of money. You never give up. What a joke. LMAO, can you hear the crazy coming out of your mouth? A product ceases to be "niche" when it is sold at wal mart, which your sacred iNovelties are. Also, enlighten us. Which device did Sammy release this week? and the last? and the week before that? Oh right, you're making sh*t up. My bad. I don't think the numbers elaborate much per volume wise. I'd prefer he try bleach. 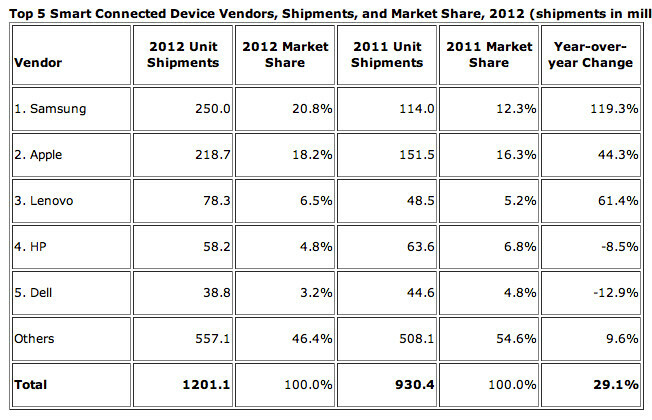 Well of course Samsung has topped Apple in smart connected device shipments for 2012. It was easy. Apple doesn't have smart devices. I think I'm with jedi on this one.... Lets not rule Apple out just yet. I have a feeling that they will be back strong in the near future! Absolutely. Selling toothpicks. They will call it: iTooth. And you will have to plug it to iTunes every day or it won't work. 1 iTooth for just 599$. There's an LTE version too for 1399$. Comes in white or black. And has gorilla glass all over it. Hey>> i'm not arguing the fact that Apple has lost its magic..lol and that Samsung has great devices. I'm just saying that Apple is an extremely smart company who, not only learns from other companies mistakes, but learns from their own. I just think Apple is listing to what users are saying... - iPhone needs a larger screen - iOS need to complete redesign - More innovation ... I just think Apple will make a comeback. There is something you should know about Apple, then. This is coming from an ex-fan and from a person who has read Steve's biography. Apple NEVER learns from its mistakes because it believes it never does any. Apple NEVER learns from its competitors. Apple NEVER listens to its customers. Yes - Apple is that arrogant. Won;'t they be release iTooth mini also? Keep destroying this apple, samsung! Evil must be dead. They was stupid enough to declare a war for all IT community, while thinking they gonna monopolize cellphone market. Hope every apple, evil spread store, will be bulldoze with the ground.